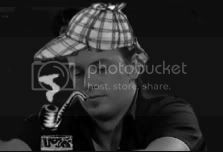 It's Detective Stu, that's who! I've had to pay a visit to Detective Stu to try to sort it all out! Stu: G'day! What seems to be the problem? Is there a mystery that needs solving? Stu: Tell me all the facts then. Crystal: WELL. Yesterday, Hollywood superstar Ben Affleck sent me an mp3 of a new Oasis song, promising that it would be my new BEST SONG EVER. It was allegedly called "Let There Be Love". Stu: Well that sounds fantastic. What was the problem? Crystal: I already had it! I've had it for years! Except it was called "It's A Crime"! Stu: It IS a crime!!! Possibly. Crystal: Oh Stu, it definitely is. I was promised a fantastic new song, and I got one that is five years old, just with a different title! Stu: Well, it's definitely not Oasis's fault. They would never repeat themselves, or serve up something that sounds exactly like something they've released before. Crystal: I know Stu, they're not to blame. So who IS? Stu: I suspect he's doubled the song. Crystal: Stu...I think you may have just solved the case. THANK YOU. Stu: It's another mystery solved!